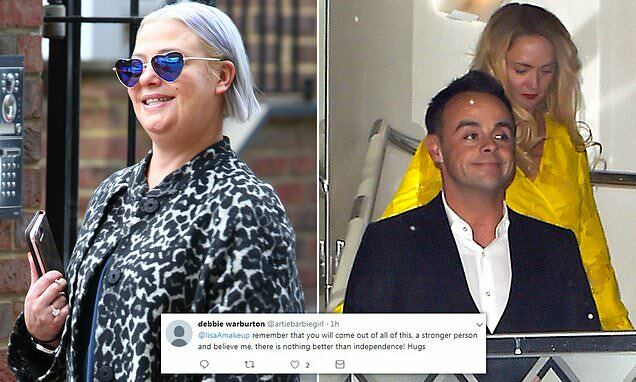 Lisa Armstrong appears to have found a way around an alleged 'legal warning' advising her to stop 'attacking ex-husband Ant McPartlin's new girlfriend Anne-Marie Corbett' via social media. The couple - who were married in 2006 - finalised their divorce this week, with Lisa, 41, getting very vocal about the Geordie presenter's new romance with their former PA - liking, retweeting and even commenting about their relationship on Twitter. She reportedly received a legal warning which demands that she stop responding to negative tweets about Anne-Marie on the micro-blogging site - yet seems to have discovered a loophole, resorting to just 'liking' unsavory comments in place of 'replying' to them. Within hours, Lisa was back on Twitter, hitting the 'heart' symbol underneath tweets that branded Anne-Marie a 'husband stealer' and a 'cretin'. Lisa was seen to 'like' all of these, as well as other now-removed liked tweets allegedly including references to Anne-Marie being 'second best', a 'backstabber' and a 'gold digger', according to The Sun. A source also told the publication: 'It’s getting increasingly bitter. After everything Lisa has been through she feels so angry and hurt.